This is not to say he is not an excellent player. and he is quite young, I am sure he can get better. HE really did not look good in this Euro. He can make things happen when the ball is flowing. But he ain't a guy that can force things to happen. I certainly can't justify +100 Euro Move for him. he didn't have a good tournament but you can only judge if he plays the same role as in juve. He was way away from the goal . I have not seen Many Juve games but in a few i did he was behind strikers and very close to the Box ... Not sure why DD took him one notch behind. He is not as fast as Coman if he had the Coman's speed then he would be perfect. I kind of Felt like in this French team he was supposed to act like a taller version of Marsel Desailey. all be it he was playing a bit higher up the field. but I just never saw him succeed once in a one on one play to dribble the guy blocking him. He one good header and of course on defense he is a presence in the air. 3..2...1....is Pogba a douche too? France has a lot of talent. Deschamps used Pogba so poorly in this game. completely different pogba to what we see in juventus and I think deschamps' tactics will be reviewed very closely. Whereas portugal's coach was a masterclass. True and look at what Bayern Munchen did instead. They got Hummels for 10 million a year and paid a 30,000,000 for Sanches. 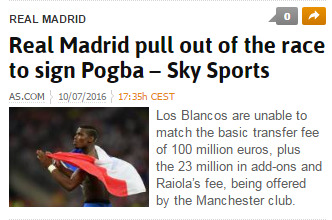 I have nothing against the kid but Pogba is not worth that but hell you can't blame him for taking the cash. At this point it does not even matter if he did not do anything special in the UEFA Cup, he is going to get paid. Pogba will cost €235, 000, 000 if he signs a 5 years contract. Not yet, not until he plays in Madrid! Find one negative thing about italian football from this guy then i give a prize . So funny that not even one single palyer were picked by the fan or the techical panel . And again you are not biased? you are the one who was swearing Casillas is better than Buffon and called me bias because I was arguing with you, you called me biased because I said Ranieri is not such a bad coach, you called me biased because I was saying Ancelotti is much better than Benitez, maybe you need to stop and look at yourself first! I said because of Buffon what? be clear with you claims and don't throw puke out, Pogba was by far the most important Juve player last season, what does this have to do with Buffon? I don't know? You are probably one the members with more bias than most people, someone who is biased toward Madrid and Spain so please, boro kenar bezar baad biad! And if you get what I said, I said the same thing, I said if bale worth 100million which he is not! Pogba should worth 200 million, Pogba is what every team have a dream of having, Bale is just another superstar. You want to argue, then argue with your opinions and facts, not by garbage argument that I'm biased while you are also biased. There is a different between Being a die hard fan and being biased. Neither you nor I are spanish or Italian. Comparing players is not a problem eventhou I think players are not comperable but labling them as saint and untouchable are stupid . Few days ago I told you iker was the mole and he desrved what he got and you called me a name .yeah I am biased lool... but do you confess to juve dosgusting match fixing scandle ( aka calciopoli ) ??? I am not going to comment about Pogba, because honestly i dont watch a lot of Serie A , so i can not really judge him. BUT , one thing you both need to understand, a player VALUE is NOT DIRECTLY linked to his ability to play. 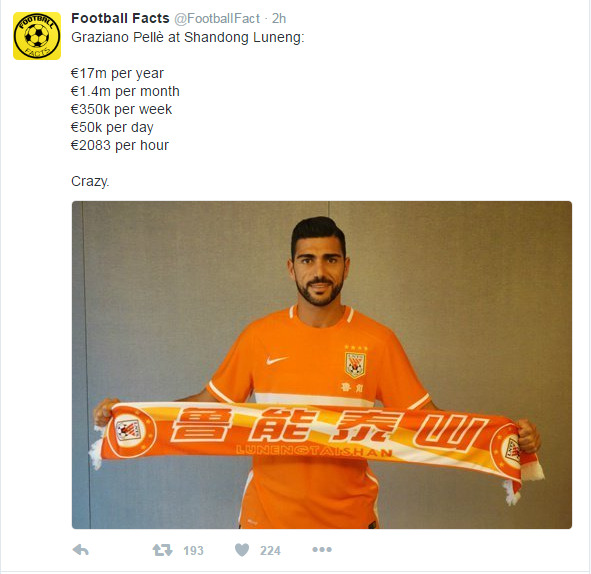 ALOT of this comes from his marketability and how much the club can make from him. Do you guys remember when Real got Beckham? everyone said stupid price tag, yet Real made that money in the FIRST year from Jersey sale. I personally think CR Value should be higher than Messi, (even though for me at least Messi is clearly a better player), why ? because CR marketability is AMAZING. Everyone know him, but if not as much know Messi. Most Messi fans are people who actually like and watch football, but you see teenage girls in China having CR poster etc. Now to Pogba, personally I dont think he is as marketable as CR , so his value should NOT be what it is , having said that, i am not sure about his skills, judging by EURO ONLY, It didnt impress me, but then again you cant judge a player by 7 games. That is very true! And also depends on his agent which he is one big snake! In the more serious note, it is very early to judge Pogba, he is only 23 years old and has a majority of his career ahead of him. He already took part of two major European finals, even though losing them and being unimpressive in another one, they still were important experiences for a player of his age. He still has a lot of room to grow and I believe if he stays in Juve he will become the best midfielder in the world, he has the athleticism, he is strong, has impressive shots, can pull some amazing crosses and through balls, knows how to kick FKs, has a lot of individual skills, strong in the air, can pass the ball, can keep the ball, in simple word, he has everything that you need from a midfielder. He didn't play his natural position in France and he was too deep to be able to show what he is made of, he is not Pirlo nor Schweinsteiger and can not play that deep since he is also not very good when the ball is dispossessed. Overall, it is not fair to judge such a great talent based on one tournament, there were many other French players who didn't perform, Pogba and Grrizzmann are getting the worse ones!